Plants have different requirements depending on the family they belong to and their country of origin. The plant should come with a care label. Have a quick read of this as it contains all the information you need to keep your plant happy. A happy plant will be a healthy plant and should reward you with lots of flowers. The label should tell you the name of the plant, how much sunlight it likes, how often to water it, if it requires feeding and the correct temperature to keep it at. To encourage your plant to flower for a longer period, remove any flowers that finish. These are ready arranged so you can simply enjoy them as they are. 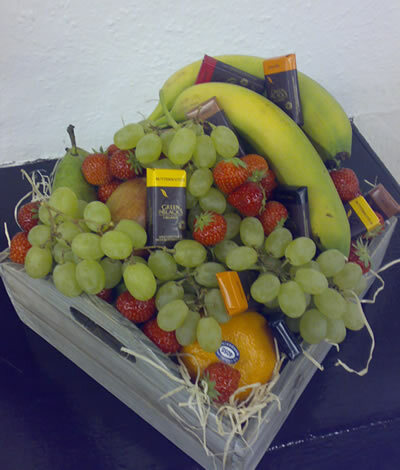 Perfect for busy people who might not have time to arrange flowers, or as gifts to hospitals and care homes. Arrangements can come in a variety of vessels such as baskets, ceramic containers, zinc pots or glassware. They are arranged in floral foam that contains water. They are very easy to look after, simply place on a protective mat and water every few days to keep the oasis wet. Position the flowers away from sunlight, direct heat, draughts and fruit. If the arrangement contains a candle, it should never be left unattended when lit. These flat style bouquets are simply layered and left with long stems, so the recipient can arrange them into a container or vase of their choice. Perfect for creative friends or someone who enjoys arranging flowers. Put the sachet of flower food in the container and fill with water. 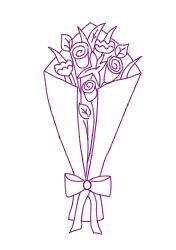 Unwrap the flowers and remove the string or ribbon they are tied with. Next remove any leaves that would be below the water line. 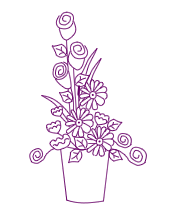 Gauge the height of the flowers against your container and trim at least 2cm off the stem at an angle. The flowers are left long in the bouquet so you can put them in a tall vase if you prefer, you may need to cut more than 2cm off the length to make them the right height for your vase. To make the display more aesthetically pleasing you might choose to vary the height of different flowers. Place the flowers out of direct heat and sunlight, away from fruit and draughts. These round shaped bouquets are arranged in the hand and tied, so the recipient can simply put them into a vase ready arranged. 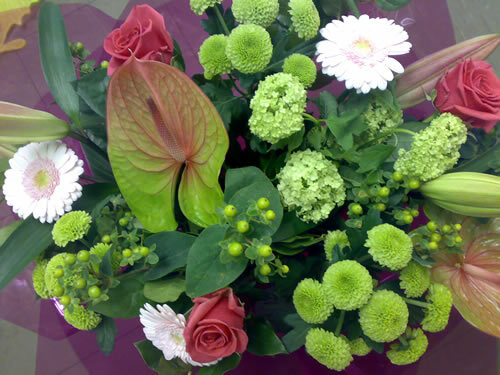 The stems are in a bubble of cellophane containing water to keep the flowers fresh during delivery. They can be left in the cellophane for a day or so. Put the sachet of flower food into the vase and fill with water. Hold the bouquet over a sink and cut the cellophane off at the bottom to release the water. Remove all remaining gift wrapping (but not the string or tie inside the cellophane wrapping) and any leaves that would be under water. Trim at an angle at least 2cm from the ends of the flowers and place in the vase. If the bouquet is too tall cut the stems down to the appropriate height. 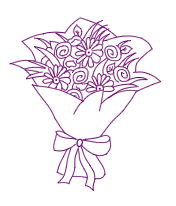 If your hand tied bouquet is not delivered in water, the stems can be simply trimmed and then place into your vase. Place your bouquet away from direct heat, sunlight, fruit and draughts. You have just been surprised with some gorgeous flowers as a gift, they look amazing and you want to keep them that way as long as possible. There are various things you can do to ensure your flowers don’t wilt prematurely and encourage every bloom to open. I’ve written this guide to help you along the way and dispel some old wives tales about flowers. Before you put your flowers into any container make sure it is clean. If your vase been lurking on a shelf for months and is dusty, it will need washing. If you wouldn’t want to drink out the container don’t put your flowers in it. Bacteria, dirt and dust will cause flowers to fade prematurely. 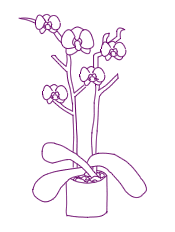 It is essential to trim the stem ends, as flower stems start to heal after being cut from the plant and air bubbles can cause blockages. Cutting the stems helps flowers to absorb water and flower food. Read the flower food packet to ensure the correct dosage. Flower food provides the necessary nutrients and prolongs vase life. Fresh flowers don’t like direct sunlight, it accelerate the ageing process. So your sunny window sill will not make a good home for flowers. Plants however need sunlight, although every type of plant has different requirements, so refer to the plant label for more advice. Direct heat such as radiators will also cause flowers to open more quickly and dry out, therefore reducing the longevity. Don’t put your flowers near any fruit as ethylene given off by fruit causes sensitive flowers to die. Remove all leaves that would be under the water line. Leaves carry lots of tiny things that will infect the water and make it smell, such as bacteria and fertilizer residue. Preventing infection is the easiest way to help your flowers last. Don’t be tempted to put anything other than water and flower food in your container, apart from having no way to measure the dosage, they don’t really do anything useful. Pop a penny in your vase? Definitely not, copper coins release copper very slowly and are therefore not effective, plus most coins are covered in bacteria. Lemonade won’t work either as it doesn’t offer enough sustenance to support flowers. Sugar won’t help either, it encourages harmful bacteria to grow and sees off your flowers early.